Sally Baynard is happy with her life. She's approaching fifty and has a family law practice in Charleston, South Carolina, Her assistant, Gina, is extremely capable and more of a friend than an employee. The only thorn is taking care of her mother who has Alzheimer's. Sally wants to take care of her, but it's not easy. Then her ex-husband, now a family court judge, calls for a favor. He has a contentious case. The husband and wife want a divorce, but they both want custody of the dog. Sherman is a miniature schnauzer with huge brown eyes. 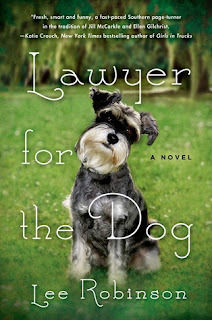 The judge wants Sally to become the dog's advocate. She agrees, but the case becomes more complicated, at least for Sally, when a contested vet bill brings her into contact with the vet. Dr. Borden is single with gray hair, and he cares about his animals. Sally can't help being attracted. This is an amusing tale. If you're a dog lover, this is the book for you. Sherman makes the people in the story look silly and petty. He's the star of the show. Sally is a good character. She wants to do the right thing and ends up creating problems for herself, but as in most romance novels – all's well that end's well. If you want a quick romantic read, you'll enjoy this book.